414 pp. Folio, conductor's score. With US two-cent stamp of Stravinsky affixed to the title page. 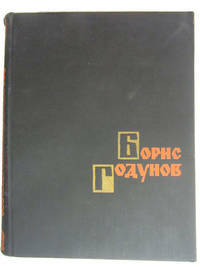 First or early printing. Full score. 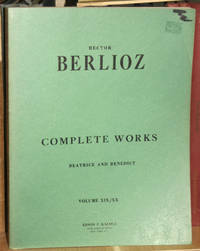 London: Boosey & Hawkes, c1949, 1950, 1951. (Composed 1948-1951.) Plate number B&H 17853. PO Sig, Professional markings in red in blue pencil. De Lerma R3. New York: Dover, 1995 89 pp. Full score, large quarto. Perhaps some fading to spine, light wear to edges, clean and unmarked. 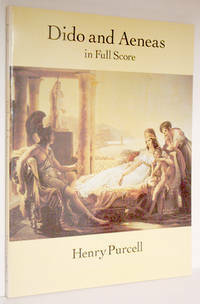 Reprint of the London Novello edition ca. 1915. Libretto by Nahum Tate. edited by William H. Cummings.. Wraps. Near Fine. 4to - over 9¾" - 12" tall. New York: Dover, 1985 225 pp. Full score, small folio. Some light bumping to extremities, a small crease in bottom right of front wrap. Text clean and white. Text in German. 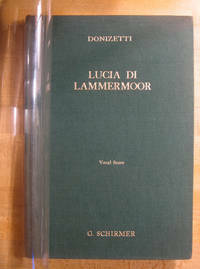 Libretto by Emanuel Schikaneder. 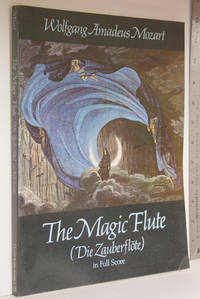 Originally published: Die Zauberflote. Leipzig : C.F. Peters, 18--.. Wraps. Very Good. 9'' X 12''. New York: Dover, 1974 x, 469 pp. 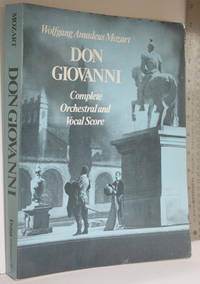 Small folio, full score. Light wear to wraps, text block clean. Dramma giocoso in four acts. '''Unabridged republication of the edition by Georg Schunemann and Kurt Soldan, with German translation of the vocal text by Georg Schunemann, originally published by C.F. Peters, Leipzig, n.d. (publication number 11462. . . . All the preliminary matter and the editors' commentary (Revisionsbericht), originally in German, appear in a new English translation . . . by Stanley Applebaum.''. Wraps. Very Good. Folio - over 12" - 15" tall. New York: Dover, 1976 xxv, 52 pp. 53 posters, 32 in full color. Small folio, light wear to wraps. 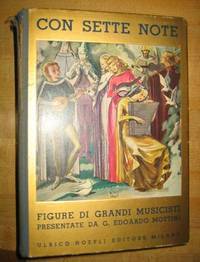 Introduction, bibliolgraphy, and notes by Broido. 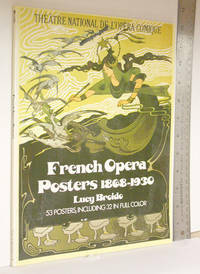 Artists: Ancourt, Barbizet, Bellenger, Bertrand, Buval, Chatiniere, Cheret, Choubrac, Clairin, Clerice, Dola, Dufrene, Dupont, Edel, Flameng, Fraiport (Georges and Gustave), Gottlob, Grasset, Gray, Leandre, Leloir, Levy, Maignan, Morel-Retz, Orazi, Pal, Pean, Regamey, Reutlinger, Rochegrosse, Steinlin, Stop,van den Berge, and Wely. . Wraps. Very Good. 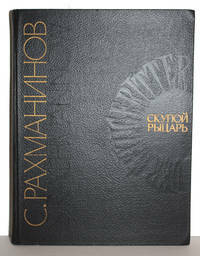 Folio - over 12" - 15" tall. New York: Dover, 1995 483 pp. Quarto, full score. Wear at corners, clean and unmarked. 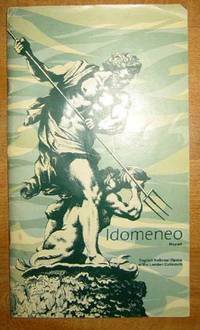 Reprint, originally published in Milano by Ricordi in 1915. 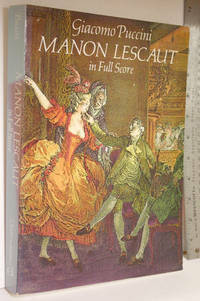 Libretto by Domenico Oliva, Giulio Ricordi, Luigi Illica, and Marco Praga ; based on Abbe Antoine-Francois Prevost's novel Manon Lescaut (1731).. Wraps. Very Good. 4to - over 9¾" - 12" tall. 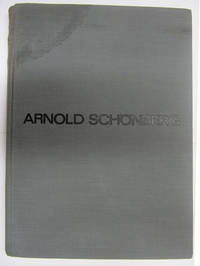 New York: G. Schirmer, Inc. 240 pp. Vocal score, 1960s. Protected by mylar cover, but green cloth has darkened at top of spine and top corner of front cover where mylar has chipped. P.O. signature and marks to TOC and final aria, where the part of Edgar's (tenor) entrances are marked. Otherwise Fine. Based on Walter Scott's ''The Bride of Lammermoor.''. Green Cloth. Very Good. 4to - over 9¾" - 12" tall.